So once again I found myself in Causeway Bay racking my brain for a dinner spot with a buddy. Take it from me – if you have worked around the same area long enough, your brain will always go back to the same place for the same food. Which was my excuse for going back to Hainan Shaoye. I have been there at least three times in the past for a quick meal, but for one reason or another, I have never blogged about it. So this time round I decided to really take note of what I am eating, look at it with a balanced eye of someone who have lived in Singapore long enough to (hopefully) know the bad and the good (the chef of Hainan Shaoye was apparently recruited from Chatterbox at Mandarin Orchard in Singapore, famous for their great chicken rice), and of someone who has his expectation, well, moderated, according to the local foodie taste. The buddy wasn’t in the mood to have a large meal (there was this set meal with six dishes to share between two person for some $400, a good deal I must say), so once again I ordered some crowd favorite. Without fail, my favorite Singapore rojak always draws the same reaction among my local friends. A grimace, that is. I guess this signature dish – cut fruits mixed with shrimp & belacan paste with cut tofu and deep fried dough, somewhat like a fruit salad with a spicy twist – is quite an acquired taste. 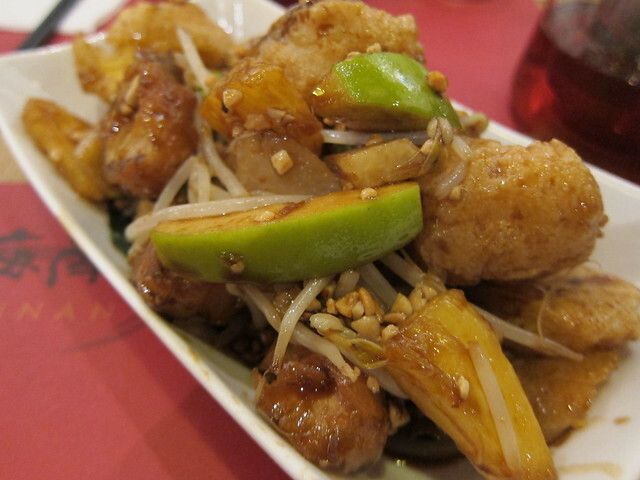 I had always enjoyed my rojak, ordering it wherever I could. The version at Hainan Shaoye, though far from being on par with the original stuff, was more than adequate to scratch that foodie itch. I scooped up everything, peanuts and beansprouts and everything else. Something about that shrimp paste just evoke that Singapore glutton in me la.